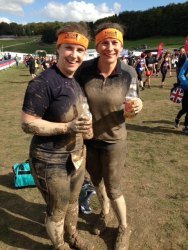 Well done to both Stacy and Corin who took part in the Zip Wire Challenge on the 18th October, together they successfully raised £310! 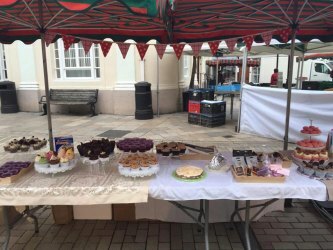 Huge thanks to; Bradbeers who gave us the market stall, WHSmith, Boots and Waitrose who allowed us to collect outside their stores & La-di-da, Auntie Annes, Belinda Clark Confectionary, Cambrooks Foods, Murray's Chocolates, Odihamam Cake Company, Popcorn Kitchen, Rich Products and the Real Macaron Company. 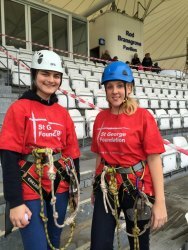 Stacy Burton is also taking the 450 Zip Wire Challenge on the 18th October at the Hampshire Cricket Ground, the Ageas Bowl! Thank you, Stacy and best of luck! Corin Bowley our events fundraiser is taking part in a sponsored 450 Zip Wire Challenge on the 18th October at the Hampshire Cricket Ground, the Ageas Bowl. "The Great South Run is on Sunday 25th October and is 10 miles around Portsmouth. 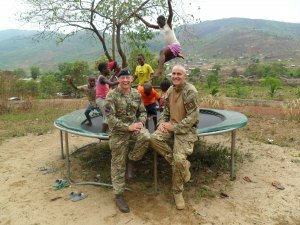 I've decided to run for the foundation as I was in Sierra Leone with the military for 4 months at the end of last year/beginning of this year. We visited the site just before Christmas and brought loads of presents to the kids, I was awe struck at the centre and what you do for the kids. 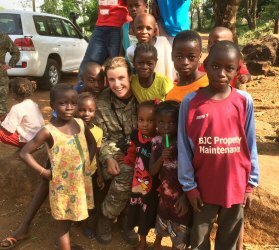 Because I've seen first hand what amazing work you do I felt it was probably the best charity I could run for, especially with the Ebola crisis on going and the fall out from it being an unknown quantity at this time. Sierra Leone has a long road to recovery ahead and I think your foundation is probably going to need a helping hand to do all you can to help those children who need it most." We wish her the best of luck and thank you for all her hard work fundraising. A Danish TV programme following the story of Ebola orphans, and based on the work of the St George Foundation, is being aired today. We very much hope that new Danish friends will soon be helping us. Sierra Leone has its first 7 days with no new Ebola cases. Great news and potentially great progress. 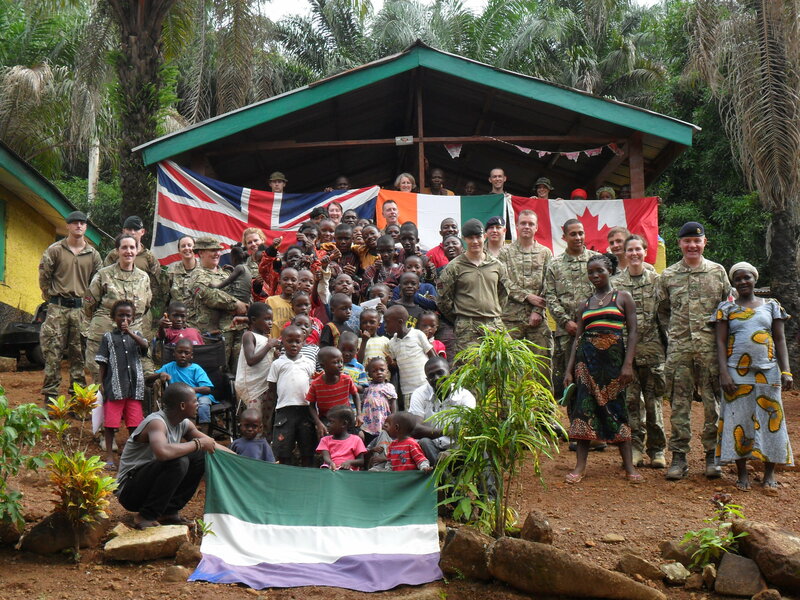 British Army – throughout the Ebola crisis, members of the British Army have been visiting St George children’s home in their spare time as well as on official duties. They have been a great source of fun for the children but most amazingly have transformed our buildings. They have tackled the plumbing, built an incinerator, supported the staff, and have stunningly decorated the buildings. Huge praise and thanks for those involved…it's stunning! The British Army are now back in the UK. 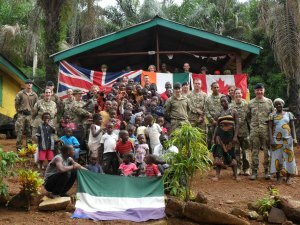 Members of the British Army have returned and met us with stories of what a fantastic job our team on the ground are doing. The consensus is that St George stands head and shoulders above everything else they witnessed. We are now working with them to find ways to raise the standards of other orphanages through a proposed mentoring scheme. We have started assisting children in another area – Port Loco. It is an area near the Guinnea border where Ebola has hit very hard and left many children in an extreme state. We have managed to get 200 back into school and are monitoring 500 families to spot those in the most desperate need. Ebola cases and the pressure on the teams in Sierra Leone and UK are gradually easing. Despite being very tired and having suffered huge stress the team in Sierra Leone carries on with supporting orphans. Update, August 2015: With the benefit of hindsight we realise this, Easter 2015, was a turning point. EVERY SINGLE STAFF MEMBER stayed at their post despite huge risks and real fear and pressure and handled with dignity the loss of a much loved and valued team member when the manager Augustine Baker himself contracted and died of Ebola. We are delighted to have news that Augustin Baker's three children are also now out of quarantine and all healthy. They are temporarily in care while final arrangements for their future are being sorted. The quarantine on our orphanage has now lifted and all children and staff inside are healthy which is fantastic news. Augustin and Bundu Baker's children will remain in quarantine (not at the St George site) for a further ten days following Bundu's death on 4 March. St George Foundation has suffered a terrible loss of a very valued staff member Augustin Baker due to Ebola and is presently under quarantine. All children and staff in the centre remain healthy. We expect to reopen and continue our valuable work on 12th March. The sad death of Bundu Baker (Augustin's wife) on March 4th occurred at home and does not affect the children in the centre. We have just received the terrible news that Bundu Baker, Augustin's wife, died of Ebola this morning. Our thoughts are with Augustin and Bundu's two young children at this awful time. The St George Foundation will be looking after their children (a girl aged 7 months and a boy aged 7 years) and will ensure they get a good education when the Ebola outbreak is over. If anyone would like to support these children please make donations directly to us but use the reference "Staff orphans" on the bank transfer or cheque, or contact us after donating to let us know your PayPal/JustGiving donation is for these children. 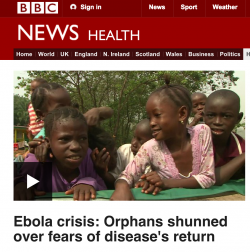 Some good news: the four children who were sent to an observation unit and tested for Ebola have all had negative (i.e. Ebola-free) results. Sadly Augustin Baker's wife, Bundu, has also now been taken seriously ill with Ebola. In addition, four children in our care have developed temperatures so have been taken to an observation unit. We should have test results back within a couple of days. We will post updates here in due course. Thank you for your thoughts at this difficult time. Your browser does not support playing audio, but you can download the file instead. It is with great sadness we share the news that Augustin Baker has died after contracting Ebola last week. Augustin has worked tirelessly to help children in our care orphaned by the disease and has been particularly active reaching out to help Ebola orphans in affected communities. His loss will be very greatly felt by all of us at St George Foundation. On Wednesday 18th Feb, staff member Augustin Baker (featured on the BBC broadcast) collapsed and rushed to the hospital. On Friday 20th Feb the St George children's centre put under quarantine. 10 staff and 25 children confined to the centre for 21 days. As of today, Sunday 22nd Feb, Augustin is as well as can be expected at this stage and was transferred to the British centre for Ebola volunteers who may become infected. Fleet Rotary club raise £780 pounds for St George Foundation. Some very generous donations and well done to the team - it was freezing out there! Thank you! We are delighted to announce that Cradleoak will be supporting St George Foundation, donating a percentage of their income from their events this year. Cradleoak runs a small social enterprise in Wiltshire organising social events to care homes for the elderly. When asked why they chose to support St George Foundation, they answered: "We were moved by the plight of the orphans affected by Ebola and want to make a difference to their lives. In addition, we wanted to contribute to a charity that does not carry a large staff, so funds go directly to this worthy cause." We would like to say a huge thank you to Cradleoak for your support. Philip Ide is running the London Marathon for the St George Foundation! He says: "I went to Sierra Leone in late December 2014, as a Photographer for the Mail on Sunday. When I was there I visited an orphanage run by the St George Foundation. It was both extremely inspiring, but very upsetting at the same time. In fact, I found it difficult to talk about it, for a few days. I will be donating a sum of money myself and hope you will join me!" Watch this video of the great evening on 15 Jan at Merchants restaurant, Southampton, where Lou Taylor had his dreadlocks cut off to fundraise for the St George Foundation and our current work with Ebola orphans. BBC News recognise the incredible work of the St George Foundation in saving the lives of children who have suffered or lost parents through Ebola. Watch the BBC News video and read more in the associated BBC News article. Lou Taylor is cutting off his dreadlocks and raising money for St George Foundation! Lou Taylor, a community leader in Southampton, is having his two foot-long dreadlocks cut off on Thursday 15th January, to help raise money for the thousands of children in Africa who have been left orphaned by Ebola. He has arranged an evening of musical entertainment at the Merchants restaurant in Ocean Village which starts at 7.30pm, with bands and singers such as LST performing before and after the main event of the night – one definitely not to be missed! Take a look at the Daily Echo article with a little bit more information about Lou Taylor’s story. This is going to be such a great evening and the St George Foundation is extremely grateful to Lou Taylor and everyone that has supported him so far.